Digital Advertising is a companies only oppurtunity to grow in a ever changing online world. The amount of time people spend online is greater now than it has ever been, and this only continues to grow. 10 Years ago companies would spend money on billboards and radio ads, but today their money is better spent with Digital Adveritsing. Advertising online is not a one stop shop. Each advertising campaign must be unique and taylored to the audience you are trying to reach. Read more below to see how my proven method can help your company grow! If your brand is not in front of your customers, your competitors brand is. The best way to think of this process is like a funnel. 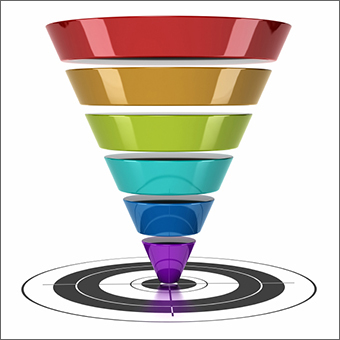 At the top of the funnel, you are trying to reach many customers, for a low price. As the customer gets lower in the funnel and closer to your goal, the more valuable the customer becomes. Reaching highly converting customers comes at a cost. It is more valuable for a company to try and obtain these customers at the top of the funnel if possible. Continue reading below to see the different parts of the acquistion funnel. The customer is getting closer! This is your chance to capture them. A captivating landing page is a must. Free offers like case studies or white papers also grab attention. Retartgeting Google and Facebook advertisments to prospects who have showed interest is a gold mine. Google Adwords is gold at this stage. The prospect has interest and they are looking for you. Make sure you show up when they search. They like what you have to offer, now give them a reason to pick you. Free Trial or Money back gurantee? What do they have to loose. Make sure to stay infront of these prospects that are on the fence. Continue remarketing campaigns and also creating email compaigns. Just make sure your not being annoying. They love you, Dont blow it here! Make it easy for the customer to move forward with their deciusion. Wether it be making an online purchase or scheduling a service, the easier for them to follow through with the action the higher conversion rate you will see. During your FREE evaluation and needs analysis, I ask questions to understand your business objectives. After the no obligation call I will perform market research specific to you niche and deliver a company specific report that will explain my reccomended approach at achieving your goals. This report will also include a cost analysis and an estimated timeline to obtain real results.